The planet Mars was recently at conjunction with the Sun (more exactly at 22 h GMT on 5 December 2008), and at the beginning of January 2009 it moved to the west side of the Sun as shown by the following images of LASCO C3 (NASA/SOHO). It will obtain the apparent angular diameter δ=4.5" at the beginning of May when the Martian season is around λ=250°Ls. 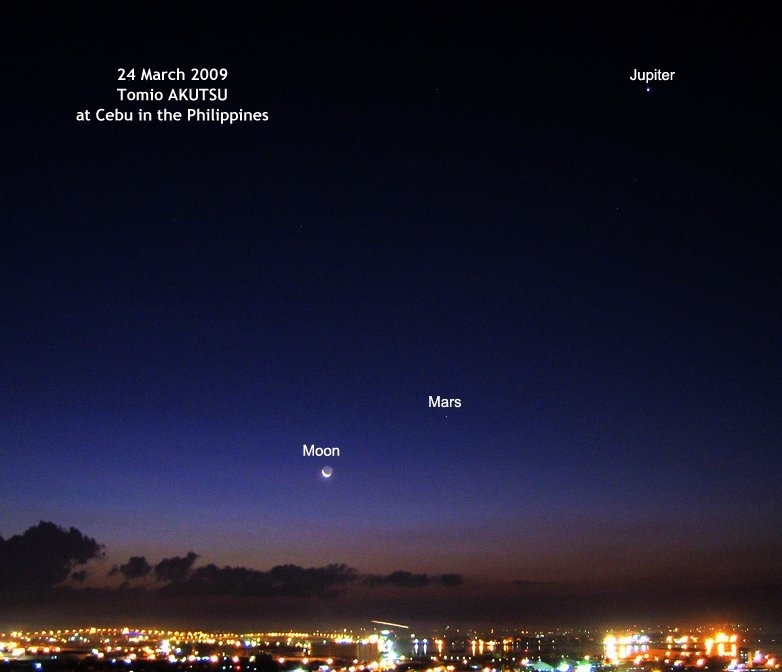 The angular diameter gradually increases this year but no opposition within 2009: The planet will be closest to the Earth on 27 January 2010 at 19 h GMT with the maximal diameter δ=14.1". The First Announcement of the International Workshop on one Century of Mars Observations (IWCMO) which will be held in September 2009 at Paris/Meudon was issued on 11 February 2009 by Nicolas BIVER (Secretary General). Click here, and also see the Official Web-Site which will be regularly updated. The workshop is an International Meeting of Mars Observers and Historians on the occasion of the Centennial of the historical era of E M ANTONIADI and his contemporaries. 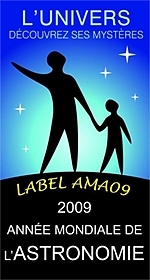 This also received a support of the French section of the International Year of Astronomy (IYA 2009). Mars is back in the eastern sky. It now dimly shines in Aquarius. 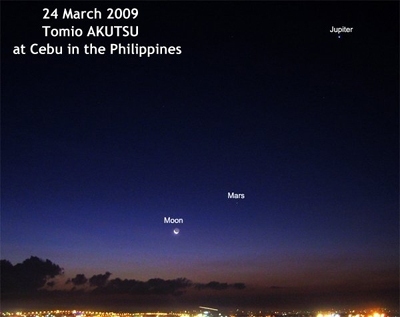 Here is shown the sky at dawn with Mars and Jupiter (as well as the Moon) taken on 24 March 2009 by Tomio AKUTSU who stays at Cebu, the Philippines. His ccd Martian images on 23 March , 24 March and 27 March are viewable here by clicking Ak23Mar09, Ak24Mars09 and Ak27Mars09 respectively. The apparent diameter is just δ=4.3". The south polar cap is apparent of the season λ=233°Ls. The central latitude φ is 23°S so that the southern hemisphere is largely seen. The apparent diameter will acquire δ=4.5" on 1 May 2009. Our Mars Gallery for the 2009/2010 Mars will soon be opened. Nicolas says this is still preparatory and needs to be validated by the participants (revised on 2, 3 and 8 September). The International Workshop on one Century of Mars Observations (IWCMO) was successfully taken place to celebrate E.- M. ANTONIADI's memorial work on 20 September 1909, well organised by Nicolas BIVER and others with about 30 participants and about 20 long talks on Mars. First it was held on 17 and 18 September at the Paris Observatory (central city) and next on 19 and 20 September at the Meudon Observatory (remote hill top place). Reception party was opened at the Paris Observatory whose white Arago dome commanded a nice night view of quiet Paris. Meudon is located in a difficult place to go (stations at valleys) but the hill top consists of vast beautiful forests and fields surrounded by big walls, and the conference was held at the Salle du Chateau of the biggest dome of the Meudon Observatory. The excursion was made to Camille FLAMMARION's Juvisy on Saturday afternoon. It was very pleasant for us to have been able to see several well-known CMO members on this occasion.